European Association for Astronomy Education » Curiosity on the Move! category: Mars, Mars Rovers, NASA Comments Off on Curiosity on the Move! The beginning of Curiosity’s journeys. Yes, the Curiosity rover is on the move, evidenced by the rover tracks seen from above by the outstanding HiRISE camera on board the Mars Reconnaissance Orbiter. If you look closely, visible are the rover’s wheels and even the camera mast. While this image’s color has been enhanced to show the surface details better, this is still an amazing view of Curiosity’s activities, displaying the incredible resolving power of the High-Resolution Imaging Science Experiment. 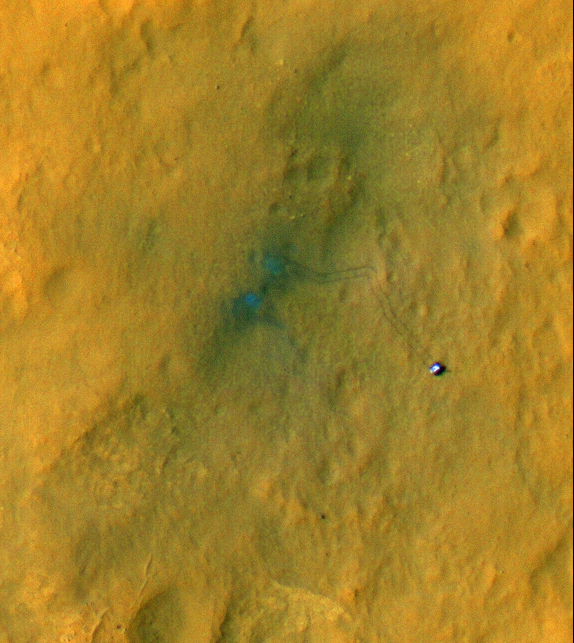 The two “blue” marks (blue is, of course, false color) seen near the site where the rover landed were formed when reddish surface dust was blown away by the rover’s descent stage, revealing darker basaltic sands underneath. Similarly, the tracks appear darker where the rover’s wheels disturbed the top layer of dust. Below is another great view showing Curiosity’s parachute and backshell in color, highlighting the color variations in the parachute, along with a map of where Curiosity has been and will be going.